Your mission, should you choose to accept it, is to upgrade your food labeling organization. Please enjoy this post from our newest contributor, Bethany Wright of WoodhavenPl.com. Find her KS posts here.! When did I make this? Who put this in the fridge? Can I still eat this?? Joking aside, food safety is no laughing matter. If you’ve ever had a touch of food poisoning, you know exactly what I mean. Sometimes we let food get lost in a real-food kitchen… and no – it’s not a fermentation experiment! So let’s upgrade our food labeling organization by using a secret weapon in the kitchen: markers. I keep a dry erase marker tucked into my circular spice rack – turned upside down so it always has ink at the tip. I grab this fabulous tool whenever I need to label and date a container. 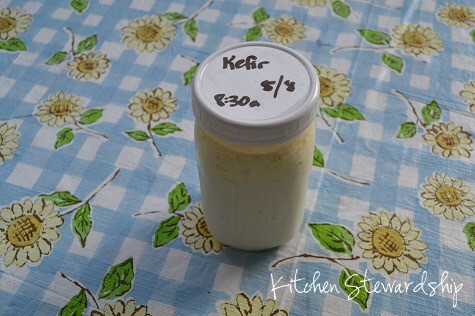 For example, we enjoy making kefir – a dairy ferment that happens at room temperature. I always write the day and time on the lid so I don’t forget when I started fermenting. But don’t stop at labeling ferments. I was standing in my friend’s kitchen just yesterday and she pulled out a WET erase marker to label all leftovers in her fridge. Unlike a dry erase marker, wet erase markers (like the Vis-à-vis brand used on transparencies) can’t be smudged off with your thumb – whether on purpose or on accident. Need to remove the marker? She just pops her containers in the dishwasher and the markings come right off. 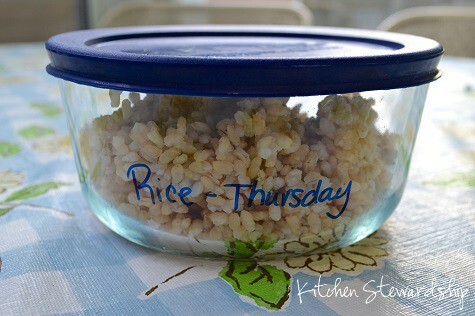 As a busy mom, she maximizes her time by prepping her food at the beginning of the week. She writes the date on her container, as well as what day she plans to use it. This lets her hungry middle-school boys know if the food is up for grabs (or off limits) when they come home hungry from school. Bonus? Wet erase markers can be used on both glass and plastic. But don’t just stop with the fridge! Do you have any mixes in your pantry? I took a permanent Sharpie marker to label all of our homemade seasoning mixes, including taco seasoning, Italian salad dressing, and ranch salad dressing. I write the ingredients that make up the bulk mix on the back of the jar. On the front I write what wet ingredients I will need to mix it with. What a relief to cut out time to find my ranch dressing recipe! Now, it’s always there. Permanent markers can be removed from glass jars with a little elbow grease. Don’t use it on plastic. Do you need recipes for seasoning mixes? 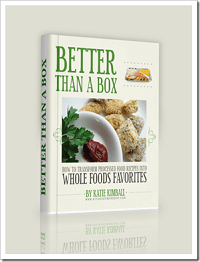 Find Ranch Dressing Mix, Italian and Caesar Dressing mixes and much more in my book Better Than a Box. I share the secrets to cream-of-whatever soup and creamy Velveeta sauce, and even “instant” pudding and whipped topping. 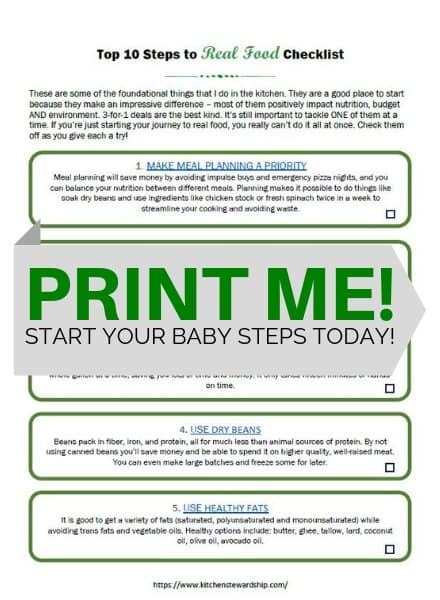 Get out your marker and get to work!Get the whole premium package with bonus printables and Kindle/Nook files right HERE. Sometimes I can be a bit … forgetful. I can’t tell you how many times I’ve forgotten about my yogurt, letting it sit out overnight. Or neglected to pull my 5#-frozen-rock-solid chicken out of the freezer. Or forgot to pull my fruit leathers out of the dehydrator … until I find them a week later. Taking a cue from my college dorm days, I now use a dry erase marker to write notes to myself on the bathroom mirror. You know, things like: “DON’T FORGET THE YOGURT AGAIN” or “check fruit leather 7:00pm.” It’s been extremely effective. And while you have the dry erase marker handy, go ahead and leave an encouraging note or doodle for a family member! Who says bathroom mirrors need to be boring? Here’s to taking a stand against UFOs in your kitchen – Unidentified Food Objects. 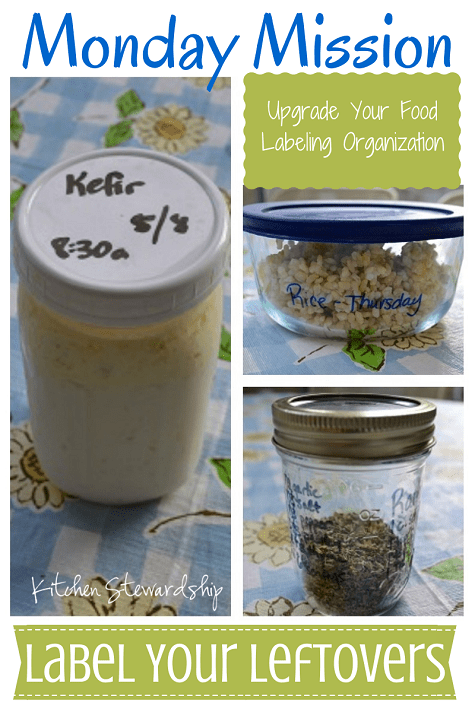 So how do you plan to upgrade your food labeling organization this week? Which type of marker will be the newest tool in your kitchen? Already a pro at organization? How can you improve? « Previous Post My Kids Eat 5 Times a Day…How About Yours? Alcohol will remove the permanent markers from surfaces when you want them gone. Great idea using wet eraser marker. I use a piece of scotch tape and permanent marker. First I write on the scotch tape then tear it off and put on the container. I remove the tape when done with the container and put it in the dishwasher. Never thought of using erasable marker on the actual container! What a great idea. My parents keep a small whiteboard and dry erase marker on the side of the fridge. When leftovers go in the fridge, it gets written on the list with the date. Bonus to this is that you can see what needs eaten up without having to open the door and hunt, thereby saving energy! I have a white board in the kitchen for notes, so I love this idea! No more searching for the tape the kids borrowed! Thank you for sharing the tip – will have to look into wet erase markers too. What a simple idea but SO SMART! I’ll definitely be using this trick. Great tips. I already do some of them. Good idea with the wet erase marker. I’ve been using freezer tape and a sharpie. If it’s not too nosy, what part of OH are you from? We live in NE OH. I’ve used the dry erase ont he bathroom mirror since my daughter started elementary, about 22 years now and now she does the same thing! I love to leave a message in the morning for my husband! I like blue painter’s tape and a sharpie. Dry erase markers are something I have not tried yet, gonna give that a try! I have a dry erase board for general reminders, appointments, tasks to be done (in case someone else wants to jump in and help). My son in law divided it into sections for me with mustache duct tape in narrow strips. The date and day (Wednesday 2 July) are always the top line for the memory-challenged in the house. 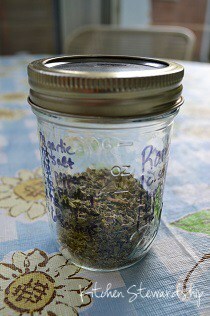 I write the recipes on 3×5 cards then either stuff them in the container or use clear packing tape to attach it to the outside of the jar/container. Packing or scotch tape and a sharpie to label jars, etc of ingredients (FLOUR, W/W: ORG SUGAR: etc) Pantry bucket lids- duct tape and sharpie before I discovered painter tape. I am fond of glass jars of all sizes, types and styles for storage. Most are recycled, scrounged or purchased second hand for small sums (too frugal to spend large sums). I am a serious scrounger/repurposer. Been doing it since waaaay before it was popular. Blesses my socks off to see you kids learning these useful skills and sharing them with each other.